Use these unique baby shower favor bags, small bags filled with a big thanks, to give your guests as appreciation for joining you on your special day. 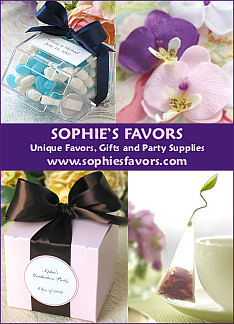 In researching, we found many different styles, including popular organza favor bags. Easily package your baby shower favor treats in style. Whether it's candy or cookies ... or a small gift, such as a candle or bath oil, bundle them beautifully as a token of appreciation for your shower guests. Keep your baby shower theme in mind when selecting your favor bags. Choose from cute, whimsical, elegant or classic. Tip: Think "simple" for your favors. You'll be assembling many bags and you want to be sure all the goodies you select will make a nice presentation in these gorgeous little satchels! Adorable bags for your baby shower favors. Choose from many different icon designs, colors, and of course, your own personalization imprinted on each bag. Endless options at a great value! With just the right amount of sheen, the Mini Woven Favor Bag can be embellished with your favorite ribbon. Add your favorite style baby shower favor tag to the Mini Natural Woven Drawstring Sac, making it ready to give. Say Fun, Fun, Fun to your guests with these brightly colored baby shower favor bags! Choose the more traditional party goodie bag or the more whimsical felt favor bag with a flower. Pink and Blue Gingham ... aren't they adorable? Looking For A Baby Shower Favor Box? goodies that your guests will be delighted to take home! favor bags too for elegant baby shower favor ideas.